Thank you for choosing London Gymnastics Academy to host your child’s birthday party! The host family is encouraged to bring their own birthday cake or cupcakes. Please advise us if there are any dietary concerns. We kindly ask that other food not be brought in unless prior permission is granted. *All LGA members for the current G.O. 2018/2019 calendar year (July 1-June 30) will receive a $25.00 discount on their party! Discount will be applied when the balance is processed. A $75.00 (+ HST) non-refundable deposit fee is due at the time of registration and will be processed on the credit card on file. The party balance will be processed on the Saturday the weekend before your party date. The birthday child is included in the total number of children attending, and London Gymnastics Academy must be notified 7 days in advance of the party date if a change in party size needs to be made (more or less than the original number you booked). Our birthday parties are for children 3 years of age and older. No children under the age of 3 years old may enter the gym (including siblings) for insurance/liability reasons. Parents are not permitted to enter the gym, but we will make arrangements for a time to take pictures. 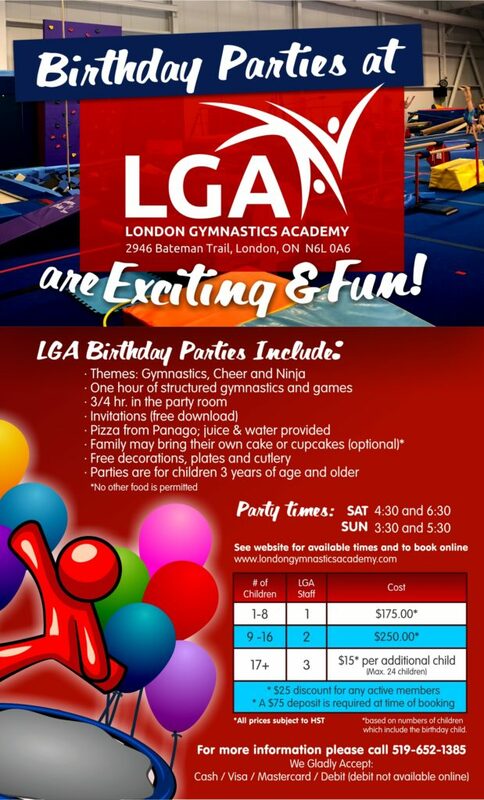 A Guest List of the birthday party attendees must be provided to London Gymnastics Academy by email 7 days prior to the birthday party date, per Gymnastics Ontario’s requirements for insurance and liability. Download the Guest List here. You can scan/email the list to us or bring it to us in person. Please email [email protected] or call the office at (519) 652-1385 if you have any questions!